Our website is the ultimate expression of what work we do and what we serve our audience. The information architecture (IA) of our website is the design through which users find the content they’re looking for—and get informed of more relevant content (by “content,” I mean all the stuff that we provide through our websites: blog articles, infographics, product landing pages, case studies, etc.). How people find content is a complex mechanism. It’s through cognitive, sociocultural, linguistic, and intuitive processes that they find what they’re looking for. It’s our job as IA designers to help users easily understand and navigate our websites. 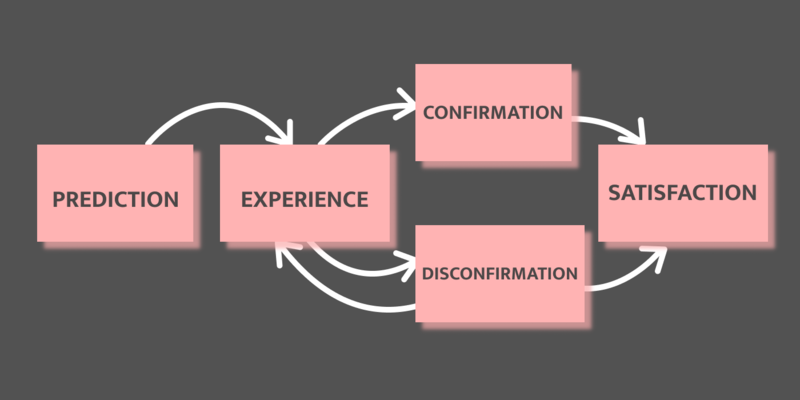 The typical yet special behavior with which users navigate and interpret our websites is through Expectation Confirmation Theory. They go through page by page, system by system by making predictions along the way. For our users, this journey is as important as the destination. If their predictions are confirmed, they reach where they wish to go and find other useful content along the way. If their predictions aren’t confirmed, their flow gets disrupted. Unless they find some sort of a worthwhile means to carry through on their journey, they will abandon the site. Findability precedes usability. In the alphabet and on the Web. You can’t use what you can’t find. In order to create experiences that satisfy user needs as well as business objectives, we need to be aware of how users find things efficiently and effectively. So as IA designers, let’s make the complex clear, the system navigable, and the information understandable to other human beings. In this post, I’ll give you three simple guidelines to keep in mind while designing IAs that assist users in their journey towards their destinations. #1 Not all content we keep is useful. Discard what’s irrelevant. Let me coin a term that will give you enough context: Infoarder. Whether we’re redesigning a website or launching a brand-new site, I’m certain all of us have the tendency to be an infoarder. We find it hard to get rid of stuff that we made. This is due to the hoarding nature of human behavior. 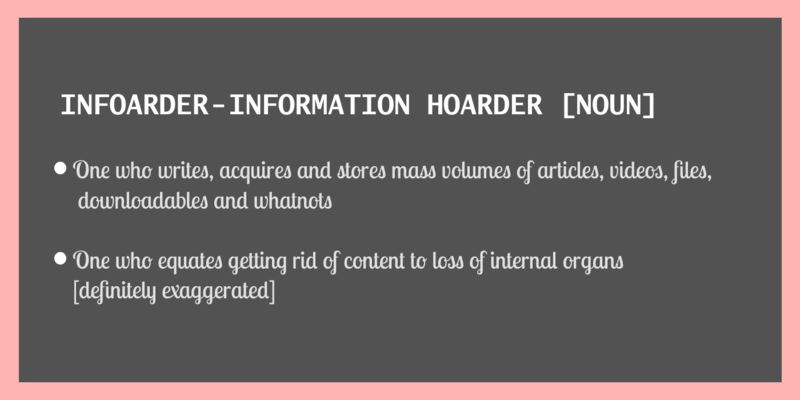 Hoarding for designers can happen with features, articles, or web pages on websites. The psychology behind this behavior is that we as humans are fearful of shortage (of content, in this case). So hoarding sort of relaxes people and makes us worry less about future. Saying that, when our design contains a large number of links to other pages and pages linked to other systems in an excessive amount, there is in fact a reversal of the relief that hoarding usually provides. It makes our users more anxious and produces discomfort. Due to this paradoxical effect, it’s essential to clean up out-of-date keepsakes and defective content. As IA designers, we need to spend time thinking about what content to include on the site. We can do that by simply going through web statistics of what content already works (if it’s a redesign), a bit of user research, and competitor analysis (if it’s a brand-new site). There’s a ton of information online on how to do each one of them effectively. #2 One user’s cozy is another’s clutter. Give people the freedom to choose. Now I know my friend isn’t intentionally trying to make her desk messy—it’s just the way things work for her. As information architects, it’s important for us to remember that each user has a different mindset. Users have their own feelings about how they want their work spaces to be, and that can help them move between things easily. It’s essential to understand the whole spectrum of users before designing the structural layout. Here, the design solution is to divide the content into logical and meaningful chunks and allow users to change the positions of the divided structures by shrinking/expanding/resizing/relocating them. This freedom to choose how they wish to work will improve users’ productivity, which is exactly what we want. #3 Seeing patterns that aren’t there is common. Be aware of such false beliefs. As people who build websites, we observe patterns here and there. They arrive out of extreme predictions and beliefs. The ability to find patterns is a great skill in itself but the danger is in developing misconceptions or false beliefs. Often we go with these false beliefs in order to satisfy our own personal opinions as designers. We think we know better, and sometimes we do. Sometimes we don’t. If beliefs were always true, we would have predicted our users’ behaviors for the entire time they were on our websites. That doesn’t ever happen, does it? So the solution is to rely on research and explanations over beliefs. Also, we should remember that the existing user research is only a means to an end for IA research.We should most certainly look into whatever research has been done previously by other teams but it is crucial to conduct usability research—especially for IA design and navigation design. Show users a good time, and they’ll come back for more. Don’t leave them confused. If you do, they’ll say goodbye. Looking for a collaborative way to work on information architecture structure? Take Freehand for a spin—it’s a tool that helps you do it all from wireframing to creative exploration, presenting to collaboration. Give it a try and let us know what you think! A designer, marketer, innovator, and writer. Preethi is the happiest when she helps bring impactful ideas to life.